The rookie safety Justin Reid had another good game, and a big part of his game was making a touchdown-saving tackle and stripping the ball that the Texans were then able to recover. Outside of that play, Reid delivered some big hits over the middle of the field to legally dislodge the ball from the receiver. Zach Cunningham produced one pass deflection and, more importantly, intercepted Baker Mayfield in the middle of the second quarter and returned it for a pick-six to give the Texans a 17-0 lead they would never be close to losing. Deshaun Watson threw for 224 yards, and while he did not produce many big plays, he took what the defense gave him and did well in not putting the ball in bad situations, especially once the Texans took an early lead. The Texans recorded 187 yards rushing, and they did so with running backs finding small creases to gain small chunks of yards. The Texans had to slowly paper cut their way down the field, rather than find big plays. Mayfield struggled in the first half, as he threw three interceptions which contributed to the Browns being down 23-0 at halftime, one of which was returned for a touchdown. The Browns’ offensive line controlled the Texans’ defensive line in the passing game to give Baker a lot of time to sit back and beat the Texans’ defense, but he was unable to find enough open receivers to come back. Myles Garrett recorded a couple of sacks, but for the majority of the game, he was absent in the passing game. He simply couldn’t generate consistent pressure through out the game. The Texans went after T.J. Carrie since he was on DeAndre Hopkins for the majority of the game. The worst plays from Carrie were two holding penalties, outside of those two plays, the Browns limited Hopkins to just 91 yards on 12 targets. The Texans had the ball for 15 more minutes than the Browns, as they slowly moved the ball down the field. And after the pick-six, they became able to just kick field goals to continue to stretch the lead. 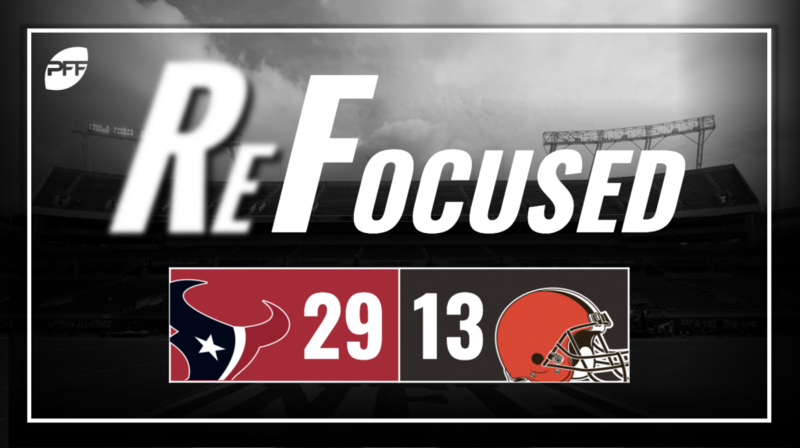 The Browns out-gained the Texans 428 yards to 384, but the Browns turned the ball over four times that gave them zero chance of winning the game.